Tacoma Urbanist | FeedTacoma.com | Tacoma blogs, events calendar, news, restaurants, photos, discussion, videos, and more! Controversial Artist RR Anderson Acquires Coveted Retail Space at UWT for "Tinkertopia"
After years of lampooning every politician and others in Tacoma and around the state, RR Anderson is about as anti-establishment as they get in the City of Destiny. Yet, last week, the powers that be joined forces and gave him a plumb: the crown jewel of a retail space in Downtown Tacoma by the University of Washington at 1914 Pacific Avenue through the City of Tacoma's Spaceworks Program for the business he and his wife started : Tinkertopia. The days of being relegated to the confines of his tiny workshop in his backyard are over. Because he recently gave up his day job, there is no going back. God Speed Tinkertopia, RR, and Ms. Darcy! More about RR revealed at his book signing at Kings Books via "Electric Elliot." The Wells Fargo parking garage, North Park Plaza parking garage, Tollefson Plaza cumulatively extinguished pedestrian life, commerce in the middle of Pacific Avenue in downtown Tacoma creating a massive dead zone void of almost any life in the middle of the city. Now the expansion for the Tacoma Museum expansion threatens to build another long lifeless blank wall on Pacific Avenue. Although the TAM expansion will have some windows on Pacific Avenue they will be covered with a screen severing the connection between the street and pedestrians. Tacoma should not try to be Seattle or any other city. However, the following changes to the proposed TAM expansion to improve the urban design of the building could greatly benefit the museum as well as downtown and people who live, work and visit Tacoma. By building the TAM expansion with good urban design principles, TAM would be doing it's part to contribute to a vibrant downtown rather than creating yet another dead zone in the city. 1) The screens over the windows should be removed so pedestrians can see inside as they would any other building and connect people with the building. The screens are a deliberate attempt to cut off the building from the street yet still make it look like the "glazing" or window requirements are being met. This is quivalent to placing windows in a building and then covering them up with posters. 2) The color on the addition should be greatly lightened up. The dark brown color make the TAM expansion look uninviting at the least and possibly even scary and foreboding. 3) The entrance to the Tacoma Art Museum should be much larger and taller so that it is obvious to visitors and makes a statement without having to install "way-finding" red arrows and signs all over the place. 4) The wind swept plaza needs to have a significant piece of art in it, the Tacoma equivalent of Hammering Man. One problem with the TAM expansion is that it look utilitarian and boring. Not everyone likes Hammering Man. However, at least it make a statement. 5) 6) 7) What do you think? How could the TAM expansion be improved so it would add more life to Pacific Avenue and he vibrancy of downtown Tacoma? Confirmed: the decade long vacant space at 11th and Pacific Avenue has finally been leased to Opus Bank. It was always a bit sad to walk by the Tacoma Pierce County Chamber of Commerce sign and see that there was ever any "commerce" on one of the most visible and central retail spaces in the City of Destiny. That has now changed and construction is well under way. ​EVERETT, Wash. – April 02, 2013 – Opus Bank (the “Bank”) announced today that it has entered into lease agreements to open new banking offices in the cities of Seattle, located in King County, and Tacoma, located in Pierce County, Washington. The new banking offices are a continuation of the Bank’s planned organic growth, which includes the opening of de novo banking offices in major metropolitan markets up and down the West Coast. Debbie McLeod, Executive Vice President, Retail Banking of Opus Bank, stated, “As the fastest growing, and one of the best capitalized banks in the Western region, we are continuing to strategically expand our network of banking offices in major metropolitan markets.” McLeod added, “Complementing our existing 22 locations in the Puget Sound region, these new offices will be Opus Bank’s first offices located in the core business districts of Seattle and Tacoma. The new Tacoma banking office will be located at 950 Pacific Avenue, Suite 150, Tacoma, WA 98402, in the Tacoma-Pierce County Chamber of Commerce building at the intersection of Pacific Avenue and 11th Street, and is scheduled to open in the third quarter of 2013. As many people and Sound Transit itself has emphasized, the light rail Link extension must have a high ridership to succeed. As obvious as this may sound, the discussion has become derailed later to many other considerations. Despite the good intentions, the City of Tacoma's failure to study the relevant factors which could have made the Tollefson Plaza a success (active permeable edges), has left it a dead piece of useless "open space" piece of concrete in all but a month or so in the winter when the skating rink is there. Tacomans are now burdened with this dead plaza just as they are with the North Park Plaza parking garage. Let's not make the same mistake with the link extension and create a vastly underutilized (empty) light rail system. Tacoma General Hospital, a major employer on the B1 corridor. This post comes out of the frustration that I feel when I read editorials like this in the paper about corridors like C1. I understand where the author is coming from, but in corridor evaluation, you need to try to back up your claims with numbers and with specifics. I try to do that here. The B1 corridor along 6th Avenue between Central Tacoma and the North End is slated to have a ridership response of 3.0 to 3.5 million additional riders per year or greater than 10,000 riders per day, matched only by the E1 corridor. The B1 corridor would link together Tacoma Dome Station, Downtown Tacoma, the Stadium District, Hilltop, and 6th Avenue - tying E1 for the number of distinct neighborhoods and mixed use centers served by a corridor. 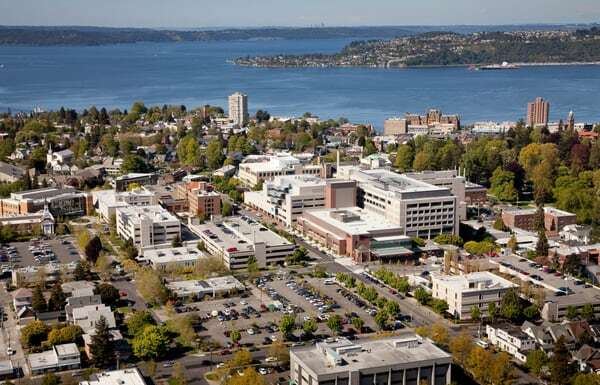 Commuters would benefit by being connected with Tacoma General/Mary Bridge Hospital, the Downtown Tacoma regional growth center and connecting regional transit services at Tacoma Dome Station. Tourists and visitors would be able to visit entertainment venues and green open spaces on 6th Avenue and at Wright Park in the Stadium District, not to mention the many festivals and farmers markets that take place in these areas. Shoppers would have more choices in the Stadium District and on 6th Avenue. Tacoma Link service would run late at night to match demand from existing night life venues in Downtown and on 6th Avenue. 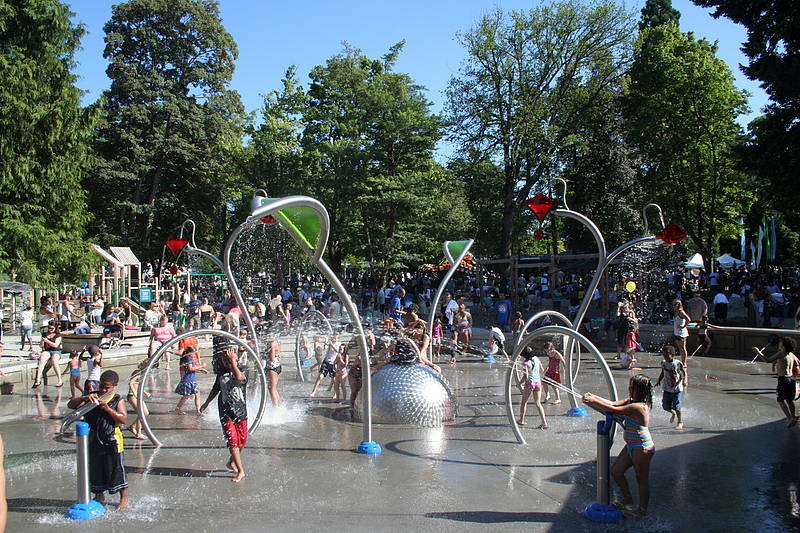 Wright Park in the Summer time. Wright Park would be served by B1 and E1.